Last Friday, the UC San Diego men’s water polo team began its quest for a conference title, playing Santa Clara University in the preliminary round of the Western Water Polo Association Championships. Seeded number two overall, expectations for the Tritons were high coming into the tournament. In its first game, UCSD delivered on those expectations, soundly defeating SCU 16–9. UCSD leapt out to an early lead with quick scores by sophomore utility Skyler Munatones, senior utility Arman Momdzhyan, and junior utility Carson Ivancovich. The Tritons also displayed tenacity on defense, recording three steals and allowing only one goal. With a commanding 5–1 lead, the Tritons slowed down. Mistakes on defense and offensive penalties allowed SCU to get back into the game, but the biggest blow to UCSD was yet to come. Late in the 2nd period, Momdzhyan was kicked out of the game for misconduct. A major part of the team, having already registered a score and an assist, Momdzhyan was forced to leave the pool and watch the rest of the game from the bleachers. Though the normal penalty for misconduct is exclusion for the rest of the game, tournaments carry stricter rules; Momdzhyan will have to also serve a one-game suspension. With the ensuring penalty shot and powerplay, SCU was able to tie the game. Instead of being discouraged, the loss of such an important player seemed to galvanize a stalled Triton offense. UCSD responded with two quick scores to end the half leading 7–5. In the second half, the efficient Triton offense wore down the Broncos. SCU floundered in the hole set, unable to defend the position without incurring an exclusion. Of the five exclusions incurred by SCU, UCSD scored off all five. With a commanding lead, the Tritons coasted into the fourth quarter, ending the game on top, 16–9. UCSD’s victory was bittersweet; despite the win, UCSD lost a serious contributor to a one-game suspension. Both an excellent player in the pool, as well as a leader in the locker room, Momdzhyan was a significant member of the team. No. 2 UC San Diego faced off against No. 3 California Baptist University in the WWPA Championship semifinals. In a tough and competitive match, UCSD emerged victorious, defeating CBU 11–9, advancing to the final round of the tournament. The beginning of the game was a defensive outing; both teams combined for only three points. The Tritons struggled to overcome the Lancers’ stalwart defense; of seven attempted shots, only one was able to find the net. UCSD’s defense, however, kept it in the game. Mirroring the performance of their opponents, the Tritons limited the Lancers’ seven attempted shots to just two goals. The Tritons ended the first period only trailing by one (1–2). As the game progressed, the Triton defense continued to be unyielding and their offensive began to gel. The offense effectively spread out the ball, with six different Tritons finding the back of the net. Munatones and freshman utility Connor Turnbow-Lindenstadt made an effective duo, combining for six points on the night. Late in the fourth period, CBU seemed to be on the cusp of a comeback. The Lancers climbed out of a four-point deficit to bring the score within one (10–9) with only 29 seconds left. 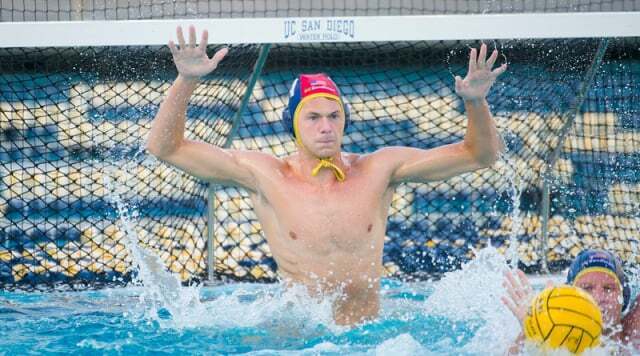 As the Tritons played keep away, bleeding down the clock, Munatones broke free from his defender and scored a final shot for UCSD, icing the game away for UCSD 11–9. Through the game, UCSD had trouble with unforced penalties: taunting by redshirt sophomore goalie Sam Thompson, a minor act of misconduct penalty by sophomore utility Cooper Milton, and a yellow card issued to head coach Denny Harper. The Tritons were fortunate that no points were scored off those penalties, but they could have cost them the game. Despite those penalties, UCSD played a phenomenal game, especially on defense. The Tritons manhandled CBU on the perimeter — playing aggressive while avoiding penalties — and Thompson, despite his taunting foul, played an excellent game recording 13 saves and one steal.